It was 4:05 a.m. on Sept. 20, 1977. Something serious was happening over the skies of Petrozavodsk . A group of dockworkers on the early shift that morning say they saw a blinding light emerge from the direction of Lake Onega in northwest Russia. As it approached Petrozavodsk, the light took on the appearance of a glimmering jellyfish, before slowing to a hover and unleashing a salvo of ultra-thin beams of light. The dockworkers were left wondering what they had seen. Some were concerned they were witnessing a nuclear attack: This was, after all, the height of the Cold War. But that did not explain what came next. After 12 puzzling minutes, the shining object transformed into a bright semicircle and jetted off back toward Lake Onega. Rather than disappearing over the horizon, it appeared to veer upward, before punching a burning red hole in the clouds, and disappearing into the abyss. No one died, and the United States, it seemed, was not involved. The Petrozavodsk jellyfish was not the first time a UFO had been spotted over the territory of the Soviet Union, but few sightings had ever been corroborated by so many people. Policemen, sailors, an ambulance crew and even a reporter for the TASS news agency all claimed to have seen the object. The TASS reporter filed his story three days later under the headline: "A strange natural phenomena over Karelia." Neighboring governments became alarmed, suspecting the Soviets had tested a new type of weapon. They demanded an explanation from Moscow, but Soviet leaders were apparently just as baffled. Officials even turned to the Academy of Sciences — the highest collection of scientific minds in the communist bloc — for an explanation. The Academy had no satisfactory answer, concluding that the UFO was a real physical phenomenon that required further study. As Soviet UFO enthusiasts began promoting their own interpretations, the Kremlin convened an unprecedented meeting of military and scientific experts. They all agreed the UFO issue was too big to ignore, and resolved to launch a state investigation into the phenomenon. Managed by the Defense Ministry and Academy of Sciences, the secret investigation began in 1978 and would run to the end of the Soviet era. A photograph supposedly depicting the Petrozavodsk jellyfish. 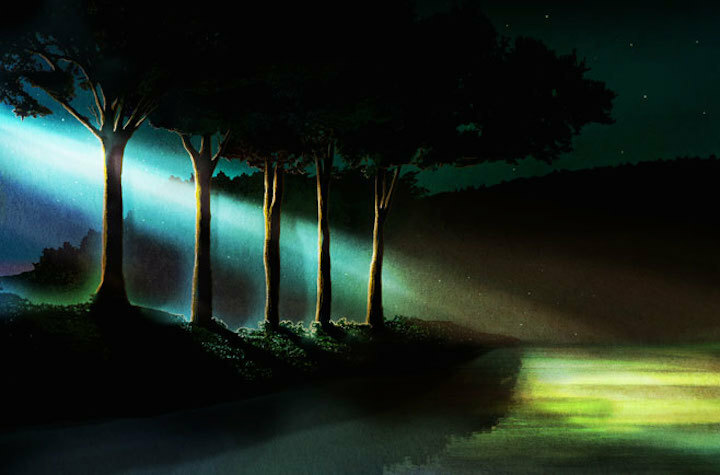 The secret Soviet X-files investigation came to be known in government circles as The Network, and was the largest official investigation into the UFO phenomenon ever conducted. For 13 years, The Network was tasked not with the simple collection of UFO reports — this was left to amateurs — but with understanding them scientifically. The man tapped to lead the project was a young astrophysicist named Yuly Platov. Now in his 80s, Platov told The Moscow Times that he found out about the project in conversation with the head of his institute. He realized it would be an opportunity to flex his scientific muscles, and so pressed his boss to be given the chance to take part. A few days later he was contacted, quite unexpectedly, and put in charge of the entire project. Initially the work was top secret. "Maybe we would really find aliens or maybe our findings would have military applications," Platov says. "It wasn't clear at the start what we might find." The Network was made up of 20 organizations staffed by specialists in physics, chemistry, optics and spectroscopy. "So many people from different professions had to be united," Platov says. "I was the one who had to unite them, and that was difficult, especially for someone like me." The astrophysicist also had to coordinate his efforts with a parallel structure in the Defense Ministry, which was not without cultural difficulties. "If a scientist is faced with something he doesn't understand, he tries to explore and study the phenomenon," Platov said. "But if something isn't clear for the military, then it is a possible target, or a potential enemy." The Network gathered data from two main sources. The Academy of Sciences provided reports submitted by Soviet citizens or scientific institutes. The Defense Ministry collected data from soldiers serving in the Soviet military, who were required to report any strange phenomena, especially if it interfered with hardware. Over the course of its existence, The Network would receive some 3,000 reports of UFO sightings. In the beginning, things were more difficult, and Platov's team instead relied on the research of independent UFO enthusiasts. King among such enthusiasts was an astronomer by the name of Felix Zigel, considered by many followers to be the founding father of Russian UFO studies. Zigel was obsessive in collecting witness reports over the years, but all of it was unverified. Platov's organization got to work checking the data. Occasionally, a fresh report would prove intriguing enough to persuade Platov and his team to go into the field to investigate. Platov recalls several fruitless trips to verify Zigel's UFO sightings. The first report came from a 10-year-old boy named Nikita, who claimed to have witnessed a UFO taking off from a field in suburban Moscow. However, when Platov arrived at the Nikita's apartment to ask questions, the boy began to sob uncontrollably. "He looked at his uncle, all doe-eyed, and admitted making it all up," says Platov. On another outing, Platov's research ream joined Zigel's amateur investigators on a field trip. "Zigel was the chief, the big boss for these guys," Platov says. "Pity he wasn't much of a scientist." Zigel's research methods were certainly unorthodox. According to Platov, the UFO researcher asked a female colleague to walk around the scene of a reported UFO landing, telling her to stand in various locations and say if she felt strange energy. "Wherever he put her, she'd say 'no,' but he wouldn't give up," says Platov. "Finally, she said she felt something, and he was satisfied." The team from the academy watched the experiment with detached amusement. After a while, one of them called out to Zigel and joked that he should blindfold her to improve accuracy. The enthusiast was not amused. It was the last time Zigel's organization cooperated with The Network. "When he realized that we weren't obsessed by looking for little green men, he drifted away," says Platov. 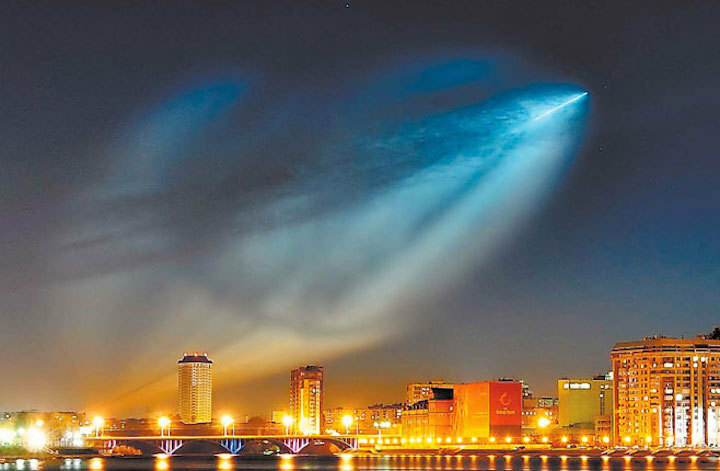 The launch of a Russian rocket from the Plesetsk Cosmodrome, as seen from the Urals city of Yekaterinburg. While Platov and his team plugged away at their investigation, Zigel continued his own search for the truth until his death in 1988. He built his own parallel team of scientists and amateurs to investigate what he believed to be a genuine paranormal or alien phenomenon. He also cultivated close ties with Western ufologists, who began publishing his case books. After his death, Zigel's legacy was continued by several disciples from the original research group. They continue working to this day, and chief among them is Alexander Semyonov, who leads a group called Ecology of the Unknown. Like his mentor, Semyonov is a true believer. Like other Russian UFO enthusiasts, he believes UFOs explain much of the technological superiority of the United States over Russia. B-2 stealth bombers and iPhones are the direct result of the Pentagon being more in tune with UFOs than the Russian Defense Ministry, they say. Joseph Kellner, an academic specializing in the Russian UFO movement, describes the efforts of these amateur investigators as "romantic," and borne out of a "suspicion of the academic mainstream." Much of what they base their understanding of UFOs on was imported from Western UFO mythology, says Daniel Galaydow, the official UFO correspondent for the Vechernyaya Moskva newspaper. He is skeptical of many reports from the 1990s, suspicious that jobless military and intelligence officers were creating stories to conform to Western UFO traditions, and then selling them to foreign UFO researchers. Yet Galaydow remains insistent that UFOs are a reality, and says the best evidence of this comes from the late Soviet period. He speaks of sources in the military-industrial community showing him evidence of a flying saucer crash in Vladivostok in 1986, with the remains supposedly recovered by the Soviet military. "I don't know whether or not Russian science has research centers that can reverse engineer captured UFOs and interrogate their alien crews to understand their technology," Galaydow says. "Though, I suppose, if we had alien technology, our government would have already used it in this new standoff with the United States." When it made its conclusions in 1990, the official results of The Network's 13-year inquiry into UFOs concluded that there was no substantive evidence of alien visitation. Just 300 of the 3,000 or so cases they investigated from 1978 to 1990 were considered legitimately anomalous. The other 90 percent were easily explained by man-made activity: usually involving aerospace technology, such as rocket launches and light reflecting off the cylindrical and triangle shaped weather balloons used by research institutes around the world. While true believers hang on to those 300 reports, they now generally accept that rocket launches were often misreported as alien activity. The Petrozavodsk jellyfish was no exception. As soon as the Western press began reporting the Petrozavodsk event, it caught the attention of a young engineer half a world away. Dr. James Oberg was a mission controller at NASA's Johnson Space Center in Houston, Texas. As a keen observer of Russian spaceflight, he thought he knew what was going on over Petrozavodsk. Oberg telephoned NASA's satellite tracking center to check whether the Soviets launched something from the top-secret cosmodrome in nearby Plesetsk. The response he received was interesting. There had been a launch at 3:58 a.m. on Sept. 20, he was told, just minutes before the Petrozavodsk UFO was sighted. It appears that the rigid compartmentalization of information in the Soviet Union prevented anyone in Russia from connecting the dots sooner. Over the years, Oberg made a name for himself as a debunker of Soviet UFO reports, showing time and time again how UFO sightings corresponded with recorded launches of secret space hardware. 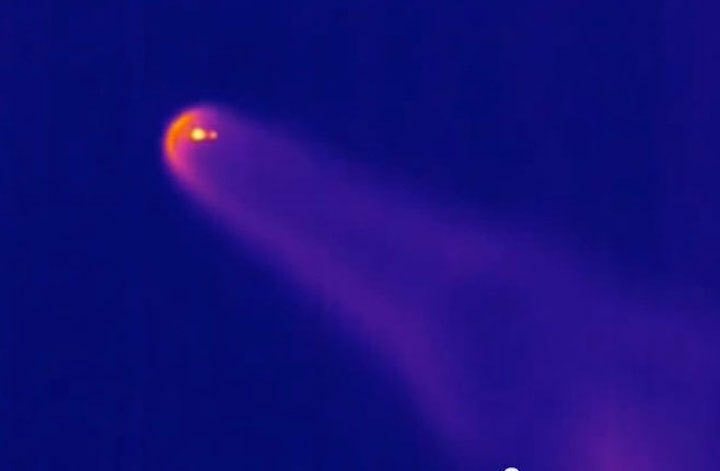 The re-entry of a SpaceX Falcon 9 booster in 2015. The rocket is firing its engine, creating an unusual visual pattern comparable to the one described by Soviet citizens in 1967. One famous incident from nearly 50 years ago, however, remained stubbornly unexplainable. On the evening of July 17, 1967, Soviet citizens from Ukraine to the Caucasus reported seeing a crescent-shaped object, accompanied by a dot of light, streaking across the night sky. Similar reports over the same regions surfaced on Sept. 19 and Oct. 18, and continued through the spring of 1968. This incident was Zigel's big break, with his reports shooting him to prominence. On prime time television, he urged Soviet citizens to report sightings of strange phenomenon. His reports were translated for NASA and drew considerable attention from engineers and Western spy agencies. But Oberg believes people were seeing something different that day. Something perhaps no less terrifying. It was "the greatest UFO cover-up in history." Rather than alien landings, Oberg says, Soviet citizens had witnessed a test of a top-secret space weapon known as the Fractional Orbital Bombardment System (FOBS). Able to orbit the earth until Moscow told it which city to target, FOBS could then re-enter the atmosphere and maneuver to its target. 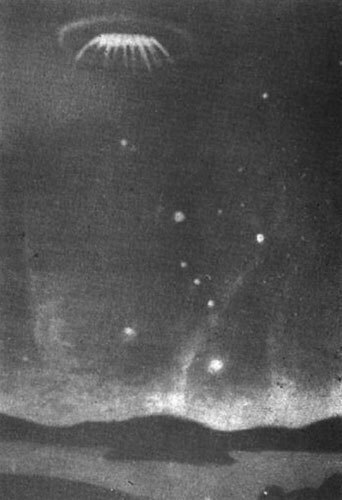 Oberg says this would have looked like an orange crescent — flames from the engine forming a bow-like wake as FOBS slid backwards into the atmosphere — accompanied by a bright dot representing the spacecraft itself. Soviet authorities later acknowledged that a weapon matching the description of the FOBS existed, but there was no visual reference with which to compare it. This re-entry maneuver was unique in the history of space travel. Oberg was watching a livestream of the re-entry and landing of a SpaceX Falcon 9 booster when something clicked. The Falcon 9 was conducting that same unusual maneuver that Soviet FOBS weapons were understood to have made in 1967. And photos of the re-entry clearly showed an orange crescent accompanied by a bright dot. And with that, Oberg says, the Soviet X-Files can finally be considered closed. "The most amusing thing is that then I finally understood why the American spy agencies wanted to study UFO reports," he says. "It wasn't, as Western UFO enthusiasts thought, because the UFOs were from another planet, but just the opposite."